Continental Railway Journeys to Paris. 2017. We treated you to Salzburg recently… (Salzburg blog). We treated you before on our first ever continental railway trip to Paris in 2016. But we didn’t tell you about our short stay last year. It was cold and it rained. And the sun came out over Versailles. Unforgettable. Unrecorded as well as Bobby managed to clear the card in his new camera before downloading the pictures. But an I Phone is always there and the pictures that follow definitely do justice to a wonderful city. Arriving at Gare du Nord we were familiar with the neighbourhood from the previous year. But not the massed gendarmes looking very Gotham City in their riot gear. A peaceful Asian demonstration came along Boulevard de Magenta. We looked for our hotel and encountered quite the biggest dog we have ever seen. As big as a horse. And the filthiest square you could imagine. Feeding time at the zoo. Ahahaha! Where Parisians celebrate and build homes for pigeons who repay them as only they know how! It wasn’t the best of introductions, but this is real Paris. Away from the glamorous tourist sights. And it has its own gems. None more so than its glorious florist shops. It was dark and it was raining and this shone like a floral extravaganza. Absolutely loved it. We love the Metro and the station names. “Jacques Bonsergent”. Named after the first Parisian to be executed by the German occupation in 1940. Inside the Metro. Just Bobby and I. A new Metro Line where the trains have rubber tyres! Stalingrad … Named after the Battle of Stalingrad. Someone like Bobby could easily spend an entire holiday on the Paris Metro. (Maybe I shouldn’t have said that)! Still raining and shut. The Louvre was enticing . Avoiding the queues and peering through the window. But, for the big day, the sun shone on our train trip to Versailles. The siege of Yorktown. The end, effectively, of British interest in America. The gardens at Versailles are magnificent. Just look at this fountain. The Palace of Versailles is truly magnificent and we will go again one day. The gardens take a long time to go round. But you cannot help thinking that it was no wonder France had a revolution. The opulence and arrogance of Royalty then was quite unbelievable. But, like so many stately homes in England, what we see and admire now bears no relation to the world that they were born into. Or the ordinary citizens. That evening we needed some shopping and landed up at Place de la Republique. A true irony and in direct contrast to Versailles. This celebrates the Republic brought about by revolution. The statue is of Marianne the personification of the French Republican. The base covered in friezes denoting various important dates in post revolution history. Nowadays, the Place has become the focal point for massive rallies when France has been the victim of terrorist attacks. 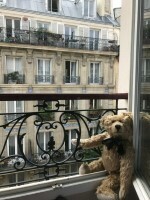 And for mademoiselles wanting to meet famous bears. So that was it for another year. The next morning was a walk to Gare de Lyon. The station for trains heading south. The train to Zurich and a change of train for Salzburg. smell of fresh coffee and pungent cigarettes Gauloises and Gitanes and fresh onion soup. Pillows like bolsters in a little hotel just of Republique. Fabulous memories!! !